The Bentley pulling an silk cloth off what might well be the biggest and grandest concept car at Geneva. This massive-SUV has a wheelbase some 200mm longer than a Range Rover. It's got similar rear legroom to the mighty Mulsanne saloon. To give you an idea of scale, those are 23-inch wheels. And it's punched through the mud - or more likely over desert dunes or down the autobahn - by a 600bhp W12 turbo. Bentley's bosses say that if they build one, it's got to be the fastest and most expensive SUV in the world. They also concede it probably won't be quite as good off-road as a Range Rover, nor quite as sporty on tarmac as a Cayenne. But they want to split the difference in some style. And for anyone inside it while it's doing its thing, comfort and unassailable luxury are an absolute given. THE PINNACLE LUXURY PERFORMANCE SUV. Bentley’s experience with the all-wheel drive Continental range makes the concept of a Bentley SUV a natural progression. 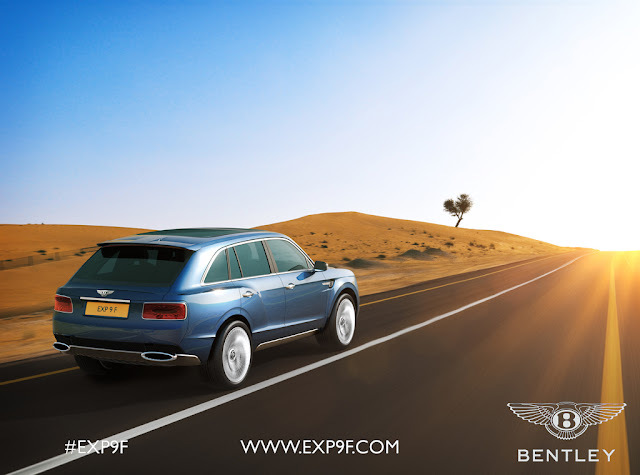 Since 1919 and the first experimental car developed by Bentley, EXP has stood for ground breaking innovation in the automotive industry. In 2001 Bentley engineers developed a concept car under the project name EXP Speed 8. Two years later the Speed 8 went on to give Bentley a heroic return to Le Mans when it crossed the line first. Now the EXP 9 F adds a new chapter to this Bentley story. The F stands for falcon; the outstanding characteristics of this unique animal have guided the concept phase. Falcons are the fastest moving creatures on earth, recorded at speeds of over 300km/h. Powerful, refined and agile a falcon is the epitome of high performance. The exterior is a bold, dynamic statement. Combining clean, muscular surfaces with signature character lines, while retaining the qualities of luxury and power – a pure Bentley. 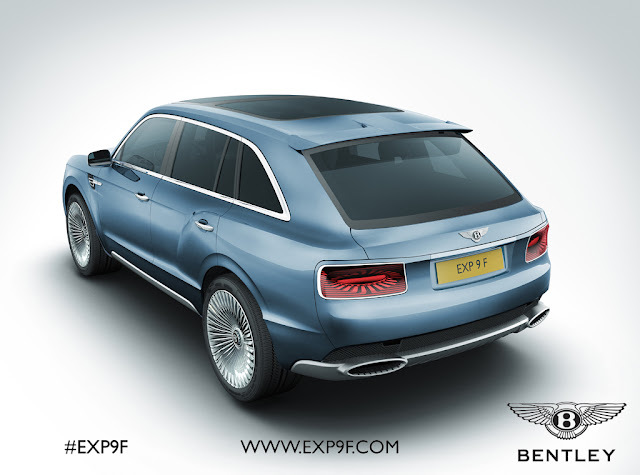 Key Bentley cues such as the matrix grille, round lamps and the strong power-line and haunch along each flank are reinterpreted for EXP 9 F.
The designers were inspired not only by the more functional nature of EXP 9 F but by the visible engineering of the famous Blower Bentleys. For example, the day-time running lamp apertures also act as the charge cooler air intakes for the engine, each with a dramatic, mesh-covered turbine fan design and ‘rifled’ inner surface finish. The turbine theme continues with the stunning 23-inch alloy wheels, the multiple spokes are reminiscent of the shape of turbine fan blades while the centrally mounted wheel nut is a visual reference both to Bentley’s Le Mans racers of the 1920s and to the modern-day Speed 8’s high-tech racing alloys. At the rear, the swooping lines of the tailgate avoid utilitarian overtones in favour of a distinctly sporting profile, while the ultra-wide, two-part split tailgate offers a high level of versatility when grand touring. The rear lights are inspired by the forms and details of fighter jet engines, uniquely designed so that they glow from within, spreading their light outwards. Twin exhaust tailpipes with ‘rifled’ inner surfaces, their elliptical shapes echo those of the rear light clusters. Bentley is renowned for its fusion of extremes. Technology and craftsmanship, luxury and performance – and the interior of EXP 9 F expresses the resolution of apparent opposites in its use of materials, techniques and technology. Traditional handcrafted elements such as wood, leather and polished metals such as aluminium, bronze and gunmetal are used to create a sense of British luxury, yet the way they are used sets a fresh and contemporary interior ambience. Soft-touch leather contrasts with highly durable surfaces. The luxurious silk wool floormats are reversible – with one side finished in durable, ribbed saddle leather for use when the driver and passengers are dressed for the great outdoors. The upright dashboard design features a full-width, one-piece wood veneer with a subtly negative surface and instruments with a configurable display. Traditional Bentley ‘bulls eye’ vents have a ‘rifled’ gunmetal inner surface for a more contemporary and functional appearance. The centre console is a blend of functionality and supreme ergonomics with dynamic, architectural layers which help to create a central spine to the cabin. Rear seat passengers can chose between business mode, with generous legroom complete with fold-down keyboard and full internet connectivity via an iPad or tablet or a more reclined position with powered footrest, drinks table and an infotainment screen for movies. The EXP 9 F concept features 4+1 seating with a rear armrest lifting to reveal a cooled compartment for champagne and glasses. Seats feature a diamond- quilted shoulder line in soft-touch leather, echoing the traditional appearance of a British field sport jacket. When the rear seats are not in use, they can be powered forward to create a larger loadspace for sports equipment or luggage. Bentley seem confident they can make money by building 3500 of these a year, which would mean increasing the company's output by about 50 percent. And they are pretty sure they can sell them, using a range of engines: W12 first, then plug-in hybrid and V8 diesel. Even if only a fraction of existing Bentley owners swapped their Range Rover or Cayenne for a Bentley SUV, Bentley's new project would be home and dry. If the SUV gets the nod, it would be engineered from now on, to be ready in 2016, keeping the factory bubbling away nicely after that.